Superstar Rajinikanth is back to Chennai and also participated in Nadigar Sangam Star Cricket has now joined Kabali team for his portion of dubbing. Pa Ranjith has tweeted " Dubbing starts !!!!magizchi!!!!!@theVcreations". The dubbing works are said to begin with Rajinikanth role dubbing and other actors are also said to join for dubbing shortly in Chennai. 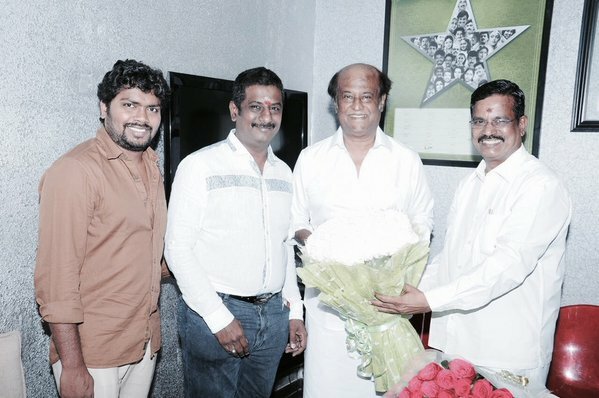 Kabali is being shaped up in the direction of Pa Ranjith and sound tracks are being provided by Santosh Narayanan. Kalaipuli S Thanu is producing the film while Radhika Apte, Dhaniska, John Vijay and others are playing important roles. Write & Share about "Rajinikanth dubs for Kabali | Kabali Tamil Movie News | Cinema Profile" !